ZHONGSHAN, China -- A no-hitter from world No. 1 Japan’s Joji Uchihara highlighted Day 1 of competition of the U-12 Asia 2016, which serves as a qualifier for the WBSC U-12 Baseball World Cup 2017. Japan defeated No. 37 Philippines, 15-0, while host/No. 18 China officially inaugurated the continental event with a 10-0 shutout over No. 48 Indonesia. No. 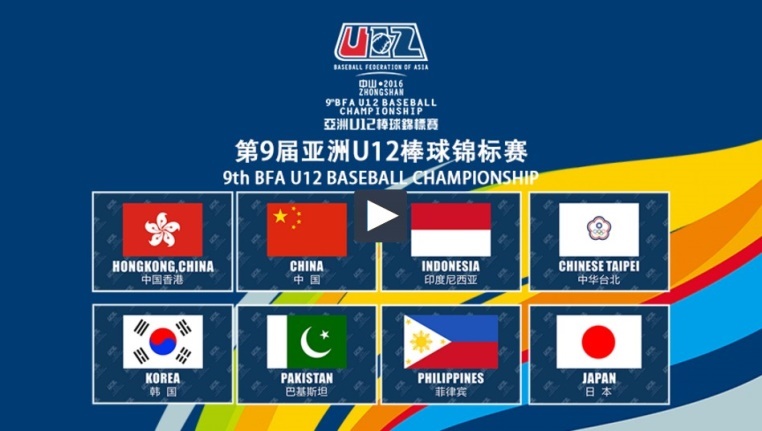 4 Chinese Taipei, the defending U-12 champion of Asia, beat No. 26 Hong Kong, 19-0, and No. 3 Korea got by No. 25 Pakistan, 5-3. The 20-game continental youth championship in Zhongshan serves as a qualifier for the IV WBSC U-12 Baseball World Cup® 2017 in Tainan, Taiwan. The U-12 Asia Championship is being hosted by the China Baseball Association.